I first heard of Woombie products when my friend Karen showed me the Woombie swaddle onesie that she got as a baby gift that "magically" quieted and calmed her nervous baby when nothing else would. The Woombie line of infant products are designed by a RN & Certified Infant Care Specialist. Through 10/4/13, take 40% off all Woombie products on $30+ minimum orders at ShopVault.com when you enter promo code WOOMBIE40% at checkout. Most Woombie items have free shipping as well. 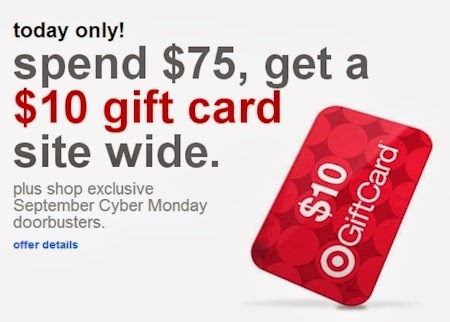 Today, 9/30/13 only, get a $10 gift crd when you spend $75 online at Target.com . Target's got tons of doorbuster deals, Daily Deals, and clearance specials going on (and free shipping starts at $50). If you've got a Target RedCard, use it stack your savings and get an additional 5% off your online order. Request your free sample of Herbal Essences Body Wash here. 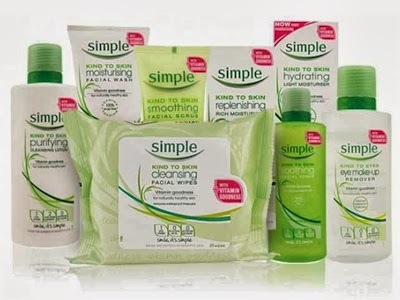 Request your free sample of Simple skincare from Target here. 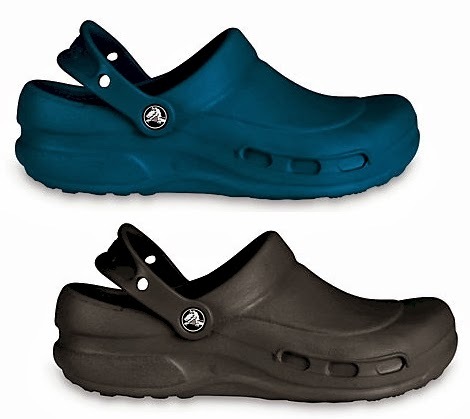 Crocs has got their "Specialist" style shoe in men's, women's and children's sizes, normally priced at $29.99, for only $9.99 when you enter promo code TODAY at checkout. Shipping is $4.99, for a grand total of $14.98 shipped. Sizes are disappearing fast, so hurry. 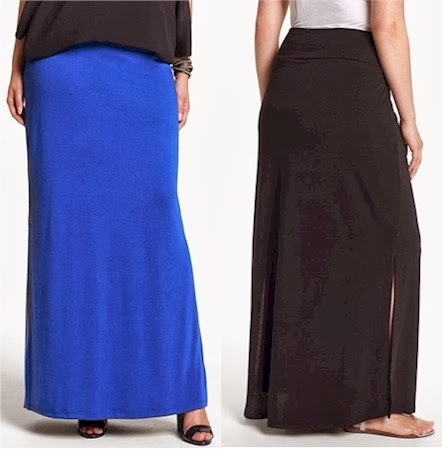 Nordstrom has got this junior plus Lily White Jersey Maxi Skirt (in three colors, sizes 1X-3X) on clearance for only $9.97 with free shipping and free returns. The black and charcoal colors are here and the cobalt color is here. This skirt was originally priced at $34.00, so this clearance price is at 70% off. Junior plus sizes are slightly smaller than woman's plus sizes, so keep that in mind when you order. Description: A lightweight, drapey knit styles an ankle-grazing skirt with a wide waistband and deep side slits underscoring the carefree fit. By Lily White; made in the USA. vAvailable online only. Another favorite no-brainer way to save money: sign up for your favorite store's email lists. Feel free to use a special gmail address desginated just for these sign-ups, if you'd like to keep shopping alerts and coupons separate from your personal email. Sign up for the Kohl's email list and in-return, receive a coupon for $5.00 off in-store and 10% off online. This promotion is for females, ages 21+, who haven't yet joined the Kohl's email list. 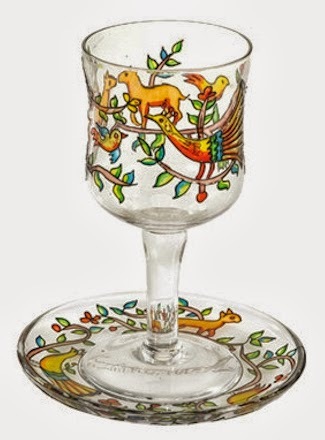 World of Judaica has got this Yair Emanuel glass kiddush cup and saucer set, featuring an elegant, hand-painted oriental design, priced at $25.00 with free shipping, but when you enter promo code DAILYCHEAPSKATE at checkout, that price drops by 13% to $21.75. I did a pretty extensive search and this is the lowest price you will find for this set online. This set is beautiful, colorful, and unusual in design (it reminds me of stained glass). It's a wonderful gift, but if you like to keep a spare kiddush cup or two around for Shabbos guests, this is an elegant, low-priced addition to your tableware. Please allow approximately two weeks to ship from Israel. (This is the perfect companion coupon to yesterday's Barilla Sauce coupon.) Print your coupon for $1.00 off two boxes of Barilla pasta, which in most stores means half-price pasta. Print this coupon twice and stock up. Print your coupon for $1.00 off one Heinz 57 sauce, 10 oz. or larger. Click over here to the product page and scroll down slightly to "clip" the $2.00 coupon. Select the Subscribe & Save price of $31.50. Click on "Subscribe Now." Because it's Subscribe & Save, shipping is free, even without a Prime account. Your grand total will be $29.50 for the 32 rolls, or $0.92 per MegaRoll. Each MegaRoll = 102 sheets and is the equivalent of a regular roll-and-a-half. Just a word about Amazon Subscribe & Save: selecting Subscribe & Save is a fantastic way to save money. It's pretty much risk-free, even if you are doing it just to get the 5% discount. You can UNsubscribe to Subscribe & Save very easily, by going to your account as soon as your order has shipped. Even if (worse case scenario) you completely forget to unsubscribe, Amazon will not send out an additional order without shooting you a warning email first, giving you ample time to unsubscribe and cancel any additional orders in time. It's pretty much an all-win proposition. Shipping on Subscribe & Save items is always free, even without a Prime membership. And if you have five or more Subscribe & Save deliveries in one month, your savings on all your S&S orders goes from 5% to 15%. 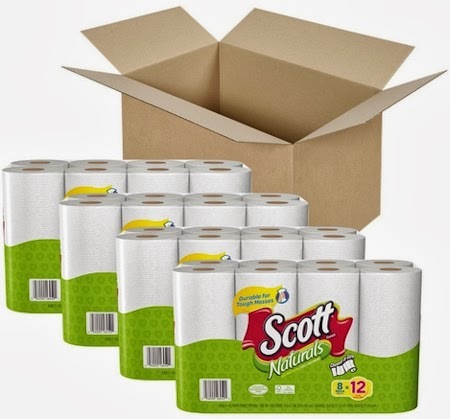 If you manage to hit that five-Subscribe&Save-orders-in-one-month sweet spot including this order, you'll save an additional 10%, and pay $26.19 for the 32-rolls or $0.82 per MegaRoll. 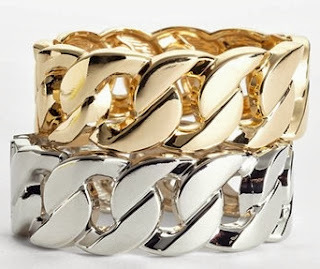 Nordstrom has got these statement Lydell NYC hinged bangles in gold- and silver-colors for only $9.97 with free shipping and free returns. So purty. I got the gold one....goes with everything. I was actually considering buying this bracelet when it was $38.00, so I'm thrilled at the new markdown price. 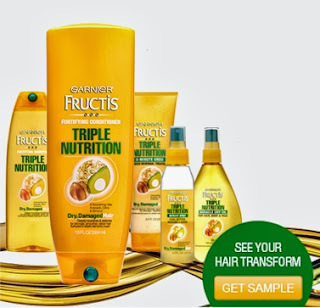 Request your free sample of Garnier Nutris Triple Nutrition here (click on gold "Get Sample" button). 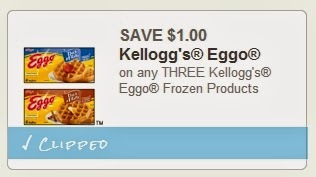 Print your $1.00/3 Eggo frozen products coupon here. 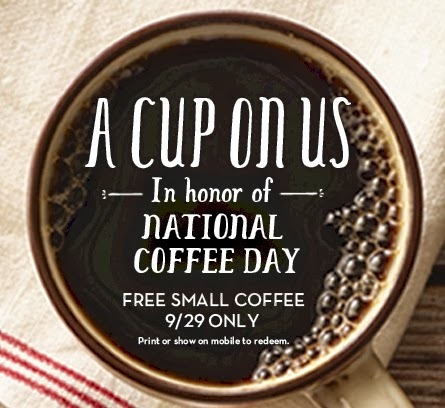 Dunkin’ Donuts is celebrating National Coffee Day, today, 9/29/13 by giving away a free small cup of hot or iced coffee all day long, when you stop by your local Dunkin’ Donuts and present the mobile offer on your Dunkin' Donuts mobile app. The Dunkin' Donuts app is, of course, free. One of the nice things about this app is that Dunkin' Donuts is a huge chain that is in just about every state of the union, so this app can provide you with some nice traveling freebies when you're on the road. You'll also be able to purchase a 14-count box of DD k-cups for $7.99 (normally $11.99) and a lb. of packaged DD coffee for $5.99 (limit 2 per person of both of these). Download the Dunkin Donuts app for iPhone here. Download the Dunkin Donuts app for Android here. Krispy Kreme is giving away 12 oz. cups of brewed coffee all day today, with no purchase necessary. You can also score $1 mochas, lattes and iced coffee drinks. Get a free small cup of coffee at Caribou Coffee when you print out this coupon or show it to them on your smartphone. Since these are a pdf and there doesn't seem to be any stated limit on how many you can print, I'd recommend saving them as a pdf on your computer, so that you can print them as you use them. These coupons expire on 10/31/13. My Coke Rewards members, log in and then click here to get a coupon for a free box of Ritz crackers for only 150 points. Print your (rare) coupon for $0.75 off any Barilla pasta sauce here. 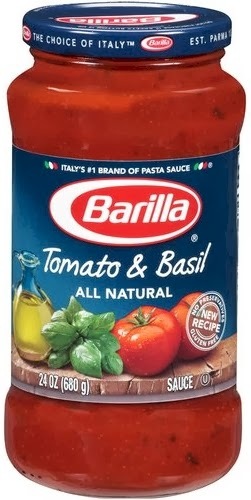 Barilla is one of the few national brands to make a number of varieties of kosher (OU-pareve) pasta sauce. Ace Hardware has got this Gorilla Rack 5-tier steel shelving unit for $34.99 with free in-store pickup (no shipping available on this item). The units measure 34"x14"x72". We bought Gorilla Racks for our garage at Costco a few years ago at Costco and paid more than twice this price, so this is an excellent buy. Print this week's Earthbound Farms coupon for $1.00 off any two Earthbound Organic products here. Just another way to buy organic produce without breaking the bank. 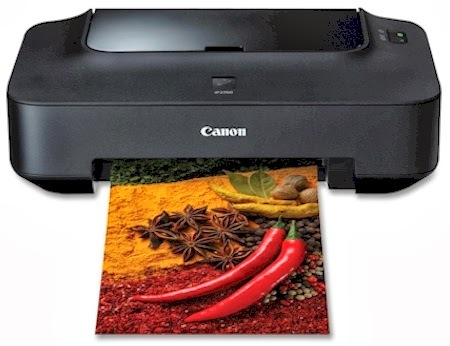 Kmart has got this Canon PIXMA iP2702 Inkjet Photo Printer for only $19.99 with free in-store pickup (no delivery currently available). I would have expected a printer priced this low to have, at best, mediocre ratings, but I was pleasantly surprised to see it getting 4 out of 5 stars over 20 customer reviews on the Kmart site and 3.9 out of 5 stars over 150 customer reviews on Amazon. This identical printer costs $43.95 on Amazon, btw, so this Kmart price is excellent. Dunkin’ Donuts is celebrating National Coffee Day on Sunday, 9/29/13 by giving away a free small cup of hot or iced coffee all day long, when you stop by your local Dunkin’ Donuts and present the mobile offer on your Dunkin' Donuts mobile app. First, "clip" this $3.00 coupon here. Then, click over here and select the $7.07 Subscribe & Save option and check out. Because it's Subscribe & Save, your shipping will be free, even without an Amazon Prime account. Your grand total will be $4.07 for a 2.97 lb. 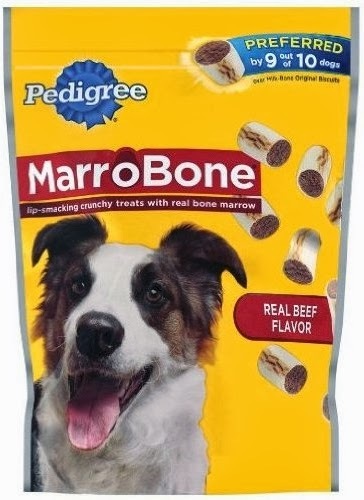 bag of these pricey dog treats or just $1.37 per lb.. If you manage to hit that five-Subscribe&Save-orders-in-one-month sweet spot including this order, you'll save an additional 10%, and pay $3.32 for the 2.97 lb. 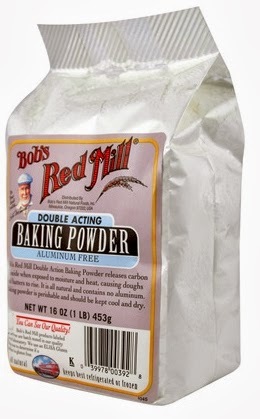 bag or $1.12 per pound. This is another one of those coupons that will run out of prints quickly. Print your coupon for $1.50 off two Twizzler or Jolly Rancher bags 9 oz. or larger here. Our Target has Twizzler bags on clearance all the time, so I'm going to try to pair this high value coupon with a sale. 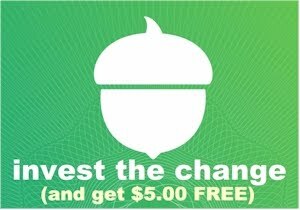 Common Kindness just came out with a new coupon: print your coupon for $0.30 off any Cuties Juice here. 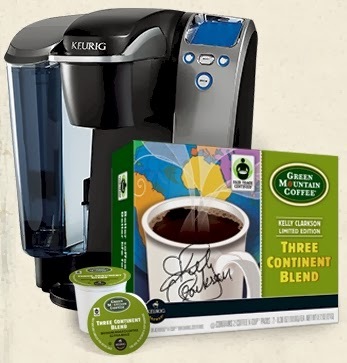 Request your free sample of Green Mountain Coffee Three Continent Blend k-cups here. Click on "Get a Sample," fill out the form, watch the :31 second Kelly Clarkson's Fair Trade Journey video, and submit the form to request your free sample. One free sample per household. It's starting to get cold out there! 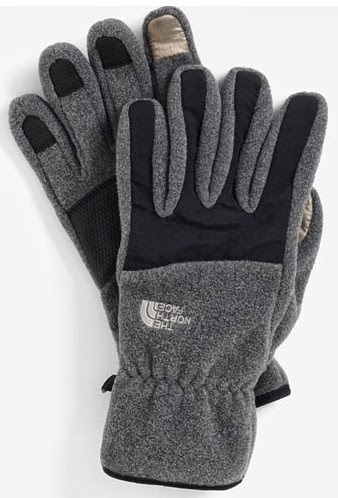 Nordstrom has The North Face e-tip Denali gloves in charcoal and black for $19.98 (reduced from $40.00) with free shipping and free returns. Item description: Soft, nylon-reinforced fleece gloves constructed with heat-containing elasticized wrists feature grippy polyurethane finger tips and silvery touch screen-compatible pointer finger and thumb tips for easy smartphone use in cold air. 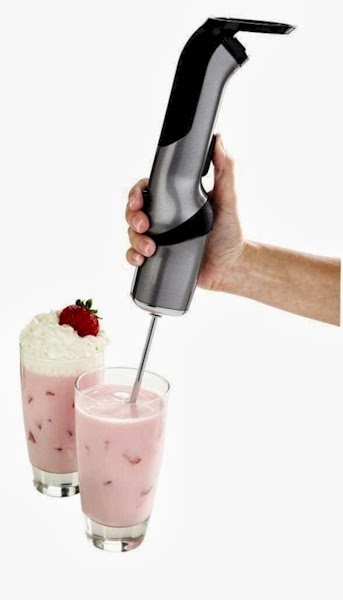 1SaleADay has got the Kalorik 2-in-1 Oil & Vinegar Mister, with precise mixture control, quick trigger & dripless spout for $14.99 with free shipping. Adjustable combination of oil and vinegar - get a perfect mixture every time. Can spray 100% oil or 100% vinegar, and anything in between. Quick trigger press will produce an oil mist; slow action will produce a dash of vinaigrette. Dripless spout keeps things clean. Dimensions: 1.8 x 8.3 x 3.5”. World of Judaica has got this stunning turquoise jeweled kiddush cup with small stones and matching saucer, depicting the "Seven Species" (Sheva Minim) for $106.00. 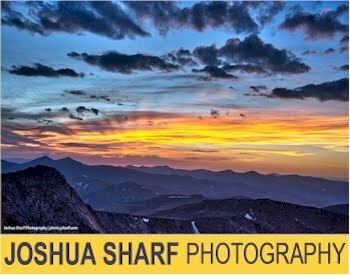 Enter promo code DAILYCHEAPSKATE at checkout and that price will drop to $92.00 with free shipping from Israel (leave about two weeks to receive this item). This kiddush cup was so absolutely gorgeous and completely different from anything I've seen before, I just had to post it. 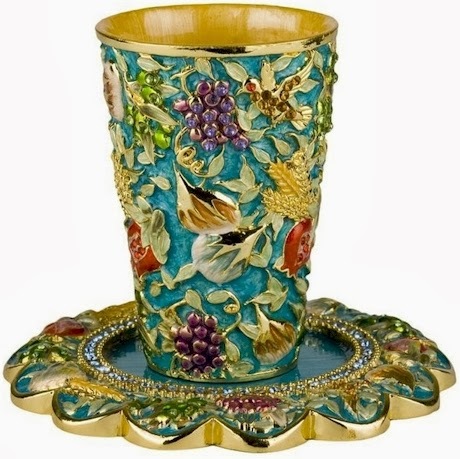 Item description: This majestic turquoise Kiddush Cup features a light blue background accented by gold that is overlaid with full-color depictions of the Seven Species that also includes small stones and is accented by gold-colored doves studded with red and yellow stones. This Kiddush Cup comes with an identical saucer that has a blue background and the seven species on the outer rim as well as small blue stones near the center. This Kiddush Cup also features styling on the background that makes it look as if were made of blue stone. This item is an ideal holiday gift idea! Hardly any of my plastic tupperware-type storage containers actually have lids that fit them at this point, and so I'm ready to freecycle the bunch and replace them with stainless and glass containers instead. 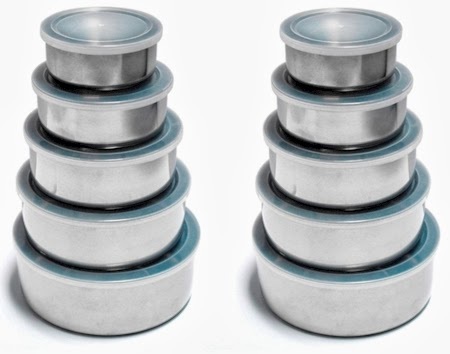 Amazon has got this double 5-piece stainless steel bowl set with lids, for only $14.99 with free Prime/SuperSaver shipping. Two packs of 5-piece stainless steel mixing bowls/food containers with lids. Total: 10 containers with their lids. Each bowl features a special stick-resistant reflective inner surface, and a lightly brushed exterior for a better non-slip grip. There are 5 different sizes included. Sizes vary from 4" to 7.1"
Here's another great Liquidation Channel find. 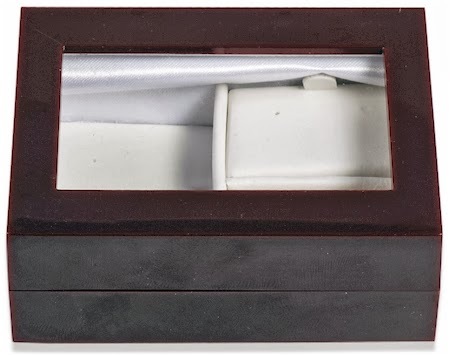 This Burgundy Travel Jewelry Box (3.5" x 3") is priced at $5.98, but use promo code SEPTEMBER5 at checkout and that price drops to $0.99 plus $2.99 shipping = $3.98 shipped. While the site doesn't offer much of a description, it looks to me like a wooden and glass keepsake box at an amazing price. The high-value promo code SEPTEMBER5 is good only through 9/30/13. Now, I will admit, I'm not a huge fan of high-low skirts, but judging by how many I saw in shul last week, I'm totally wrong! This uber-popular style is all the rage right now. Nordstrom has got this MOD.lusive Striped High/Low Skirt reduced from $44.00 to only $14.99 with free shipping and free returns. It comes in sizes small, medium and large and in black/ivory stripe and navy/oatmeal stripe. 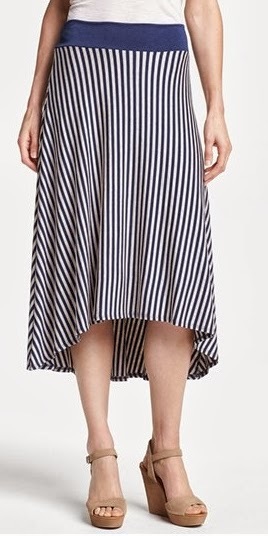 Fantastic price, and I do like the fact that the stripes are up/down and not across (makes you look tall and lean), and that the "high" part of this high/low skirt still comes down over the knee. Nice buy at Nordstrom. And free returns means that if you don't like the way it looks when it arrives, you can return it without paying shipping, so no worries. If you live near a Nordstrom store, you can bring it in to the store to return, and avoid a trip to the post office. 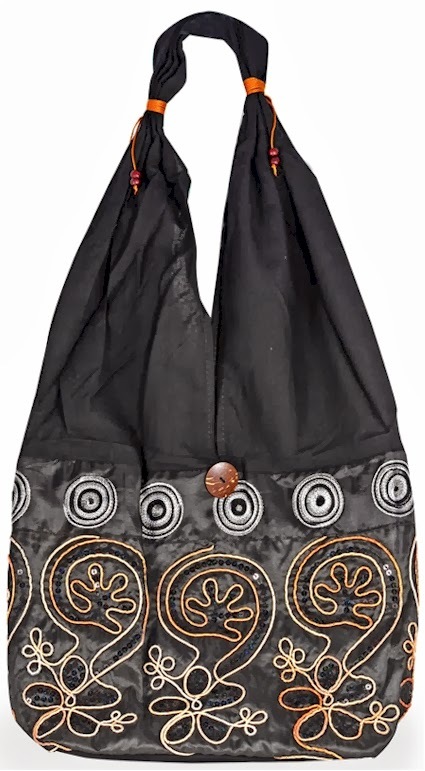 Liquidation Channel has got this black and orange silk and black cotton embroidered over-the-shoulder bag (10" x 10" x 4") marked at $7.99, but use promo code SEPTEMBER5 at checkout and that price drops to $2.99 plus $2.99 shipping = $5.98 shipped. Rechargeable, cordless design with heel rest. Pivoting head twists to swiftly and easily switch functions. 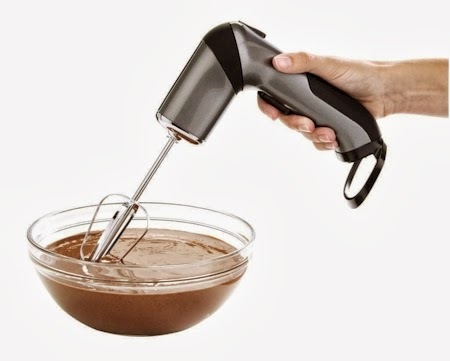 3 attachments: standard beater, whisk and drink mixer. Two power settings let you mix, stir, beat or blend. 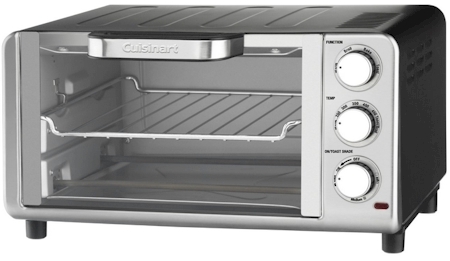 If you're interested in the Cuisinart TOB-40 classic toaster oven broiler instead, Home Depot has it for $79.95, but that drops to $63.95 with free shipping, after you enter promo code FALL20 (which is case-sensitive) at checkout. Rubberized dials are easy to grip and adjust. 1,800 watts to toast, bagel, bake and broil. Full-size interior holds an 11 in. pizza and 6 slices of toast. Always-even shade control monitors the temperature and adjusts timing to consistently toast to the shade selected. Cool-touch handle helps ensure safe operation. Automatic shutoff feature enhances your safety. Nonstick interior is easy to clean. Front removable tray for versatility. 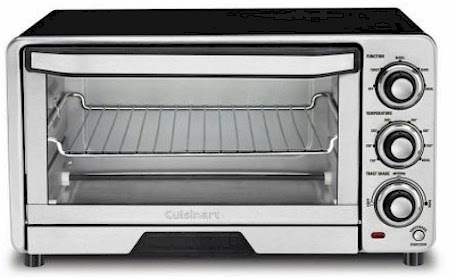 Auto side-out rack for hands-free loading and easy removal of cooked foods. Includes a baking pan/drip pan, a broiling rack, a wire rack and a clutter-free cord wrap. Stainless-steel front creates a sleek look. Print your coupon for $3.00 off any Triaminic product here.